It has been debated regarding to what extent Meyer was inspired by the Italians, the Napolitans and the Bolognese fighting systems and although there appears to be ties to this, exactly what they are and how they came about is still unclear. However, comparing Marozzo’s and Meyer’s dagger images I think there is an unusual amount of similarities between the two, enough to lead me to believe that Meyer is the closest to Marozzo’s treatise, when comparing also to other treatises, both “German” and Italian”. 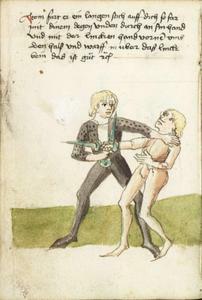 Examining the illustrations in both treatises we find that Marozzo shows 17 dagger fighting pairs and 14 of them show distinct resemblance to 12 of the 22 dagger fighting pairs in Meyer’s treatise, with two of the fourteen basically being variations of techniques shown in the 12 pairs of Meyer. Despite these similarities it is of course possible that Meyer was inspired by another master with similar techniques to that of Marozzo. Here is a brief and quick comparison of images taken from Achille Marozzo’s fight treatise of 1536 entitled “Opera Nova” and Joachim Meyer’s “Gründtliche Beschreibung der freyen Ritterlichen und Adelichen Kunst des Fechtens” of 1570. A couple of images have been reversed to show the similarity, as all techniques can be done from both sides. Also, no proper analysis of the texts have been done in this comparison, but parts of it is based on what I gathered from Roberto Gotti’s excellent Marozzo dagger class at Swordfish 2011. One possible difference between the teachings of the two masters that I think we can see is that Meyer appears to focus more on controlling the dagger hand, while Marozzo works more with both hands of the opponent. However, a proper text analysis needs to be done to corroborate that thesis. 1. Simple tripping over the leg while controlling the dagger arm and pushing him over your leg. Quite similar to Image 9 below. A similar move can be seen in Peter Falkner, Ms.KK5012 47v. 2. This is an example where the same technique is applied by both masters, but in Meyer’s case to the dagger hand. This is the right side variation of Image 13. Note that Meyer’s image has been reversed. First grab his arm with your left arm and then step in towards his left side while twisting around and breaking his arm and/or throwing him over your shoulder. A similar move can be seen in Peter Falkner, Ms.KK5012 52r. 3. This is part of a preparatory move for several follow up techniques, shown later, for instance in Image 8 and Image 10. A similar move can also be seen in Talhoffer and in Peter Falkner, Ms.KK5012 55r. 4. Marozzo shows grabbing the beard and pulling/twisting here, but Meyer instead relies on pulling the shoulder, which perhaps is more usable in more contexts. 5. This is a technique where you strike down with both hands to break the opponent’s grip and then you punch straight up into the opponent’s face. 6. A disarm where you simply twist his dagger clockwise. 7. 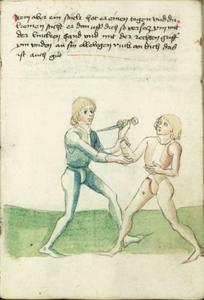 A similar technique is often shown in the German treatises, but then you instead pull the opponent towards you while twisting around and pushing him down by your side. Here, you instead push him away from you. 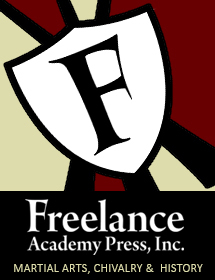 The images are slightly different in footwork though, but the principle is the same. Also the difference in footwork might be explained by a difference in time and distance, where Meyer has moved much closer having his leading foot inbetween the feet of the opponent. A similar move we also see in Talhoffer and in Paulus Kal BSB Cgm 1507 79v, aswell as in Fiore’s and Vadi’s treatises. 8. This is one of the techniques you can do following Image 3 above. Twist his wrist to keep his elbow and forearm angled properly. 9. This is a variation of Marozzo’s technique shown in Image 1.Simple tripping over the leg while controlling the dagger arm and pushing him over your leg. Here Meyer’s image has been reversed. This can also be seen in Fiore’s and Vadi’s treatises. 10. Another variation of techniques you can do following image 3. First control his dagger, then duck underneath his elbow while twisting his wrist so you control his arm properly, then grab his knee/thing and pull him up so he falls. 11. This is a simpler version of the technique in Image 10 above, where you skip ducking underneath his elbow. 12. Again, a tripping over the leg after having blocked his dagger arm. A similar move we also see in Talhoffer. 13. Parry his thrust from above with your right hand while twisting around and then grabbing his arm with your left hand. Then throw him over your shoulder, breaking his elbow as you do so. Meyer does it slightly differently as he does not step in front of the opponent and throws him over the leg as Marozzo does. This is the left side version of Image 2. 14. To be honest, I am not quite sure how to do this one, since Meyer doesn’t describe it and I don’t read Italian. Also I can’t recall this one from Roberto Gotti’s class at Swordfish 2011. I can think of a few ways to end up like this, but to me it seems most likely that you parry his thrust from his upper right by grabbing his dagger hand with your right from your outside left and then continue spinning around while stepping in so you can grab his thigh and throw him over your hip. PreviousSpanish FEEH HEMA event in the Mallorcas! NextHEMA event: Bilbao Armata 2012 in Spain. A great article! Especially as this is the first time I have seen anyone compare the images directly – telling not only in the similarity of the chosen plays, but in their illustration themselves. Especially as Marozzo was reprinted just a few years before Meyer’s work.